Terror victim status conferred on yeshiva student after IDF determines that PA police who killed him were not in danger. The Ministry of Defense has decided to classify Ben Yosef Livnat, who was gunned down at the Tomb of Joseph in Shechem, as a terror victim. Reshet Bet (Channel 2) state-run radio reported Thursday that the decision follows the determination by the IDF that he Palestinian Authority policemen who killed Livnat were not in any danger at the time. 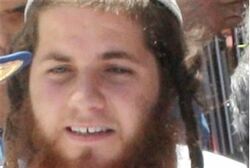 The PA inquiry into the incident found that the men who shot at Livnat acted in breach of the protocol for opening fire. The IDF finding was handed over to the Minister of Defense and to the Chief of Staff, who approved it. The commander of the IDF’s Samaria Brigade said in closed conversations that Livnat was murdered and that the police who fired at him and the group of yeshiva students with whom Livnat had come to the tomb, intended to kill Jews. The commander also noted in his assessment that the event – along with others – is a warning light regarding the future cooperation with PA police. PA police, in and out of uniform, have a long history of carrying out terror attacks against Jews. This fact, along with the fact that the PA is run by terrorist organizations Fatah and Hamas, has led many to see them as a terrorist force in disguise, rather than a legitimate police force. The Almagor Terror Victims Association demanded that Interior Minister Yitzhak Aharonovich issue an arrest warrant for the PA police officers who murdered Ben-Yosef Livnat and call for their extradition, following publication of the findings. The IDF rejected at the last minute Tuesday a plan by Knesset members to conduct a prayer session at the Tomb of Joseph. The MKs wanted to mark the thirtieth day since the murder of Livnat, but the army feared a conflagration after the PA threatened violence.